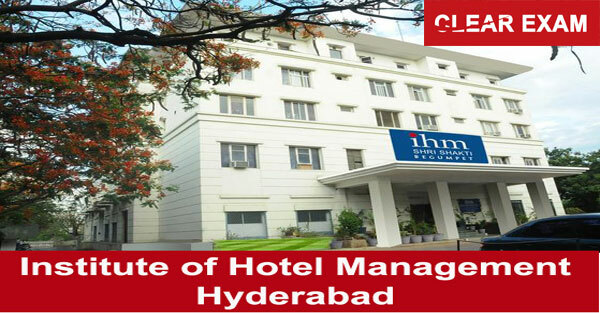 The Institute of Hotel Management, Hyderabad got affiliated to National Council for Hotel Management and Catering Technology (NCHMCT) in the year 1986. NCHMCT is an autonomous body established by Ministry of Tourism, Government of India. The National Council for Hotel Management and Catering Technology monitors’ the complete system of organizing entrance examination, awarding of certificates, year end examinations, providing, updating and reviewing of common syllabus and conduct programs of faculty development of the college on all India basis. Admission to IHM, Hyderabad Bachelor of Science course in Hospitality and Hotel Administration is done on the basis of NCHM Joint Entrance Exam. The exam is being conducted in the month of April. The application form for the exam is available both in online and offline mode from December to April. The national level entrance exam is being conducted by National Council for Hotel Management and Catering Technology. The application forms for NCHM JEE is available online and can be downloaded by candidate from official website of NCHMCT. The offline application form can be taken from NCHMCT office or any of its recognized institutes. The candidate is required to take the print out of the form after filling all the details and paste their passport size photograph on the space provided in the application form. Candidates need to send the application form through registered post/speed post to NCHMCT Noida office. The applicants can also deposit the form by themselves at the office. No form will be accepted if sent through private courier services. The fee is required to be paid either through Credit/Debit Card or Demand Draft (DD). Applicants need to draw the Demand Draft in the favor of ‘NCHM’ payable at Noida/Delhi. The exam is conducted in both Hindi and English language leaving the ‘English language’ section. The exam carries 200 questions with 1 mark carrying each question. There is also negative marking of 0.25 on each wrong answers. The Aptitude for Service Sector section is being marked on the basis of graded scheme, the most appropriate answer is given 1 mark, and further 0.75, 0.50, 0.25 respectively. IHM, Hyderabad provides student with best facilities like equipped Gym, kitchens, computer lab etc. The institutes provide students with various sports activities and good counseling. Further the institute provides best quality education to students of International Standard. The students also get best job opportunities as the institute provides campus placements in the best leading companies. For more info and updates about various IHMs of India, students can go through Success Mantra’s latest articles on Hotel Management.